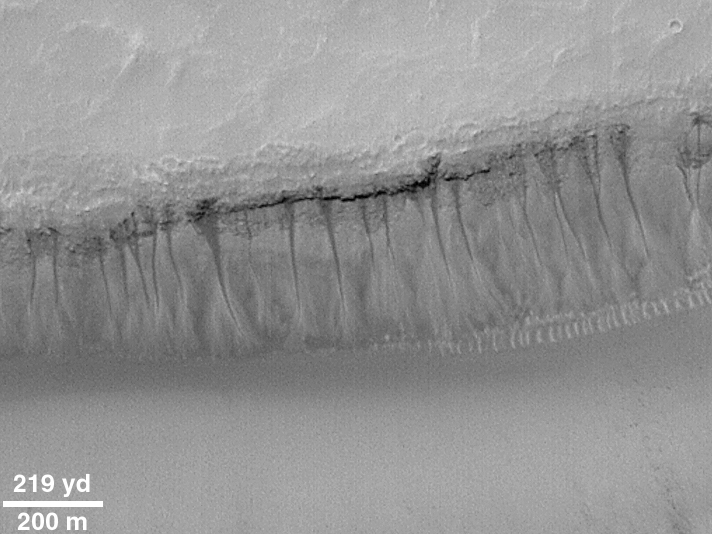 Evidence of large floods can also be found on Mars. Figure 4.7 is a satellite view of the 600 km wide Tiu Valles. The flood originated from the bottom and flowed towards the top. At the source region, the terrain is chaotic. 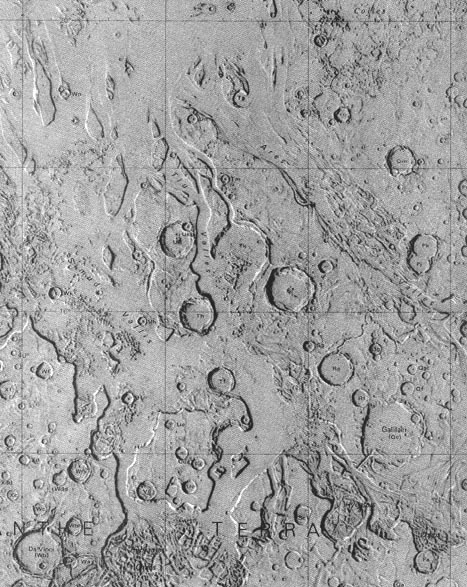 The flow channel near the origin was nearly 200 km wide. 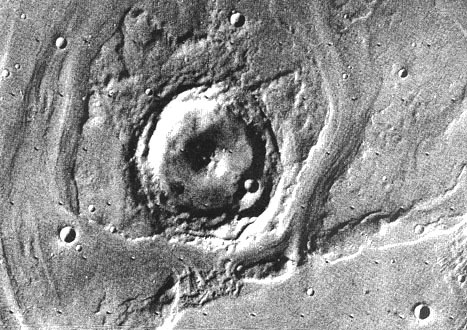 Flooding could be so intense that it cut through ridges (Figure 4.8) , and wrapped around craters to form tear-shaped islands (Figure 4.9). This mosaic shows a flow originating from the south (bottom) and turning to the northeast at the middle of the image. Many tear-shaped islands can be recognized. At the point where the flow started to turn, a chaotic terrain was formed. 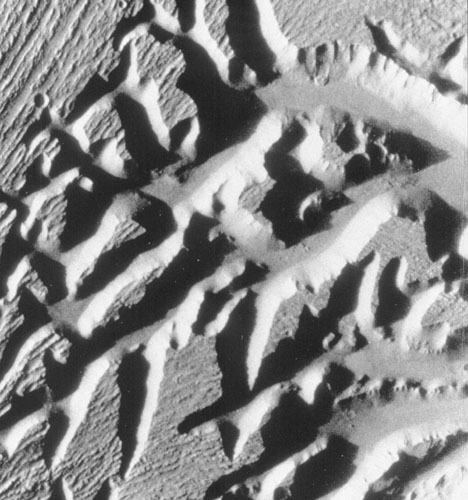 A close-up view of this chaotic terrain is given in Figure 4.10 . Notice that sunlight is from the left and the gray rough area near the upper left corner is the top of a plateau. 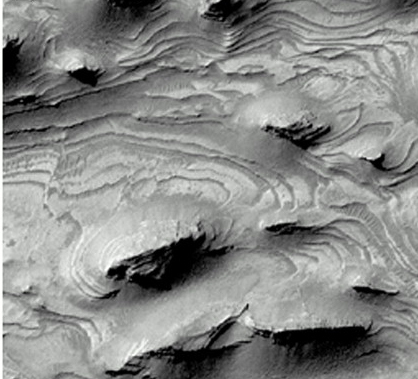 Exactly how these chaotic terrains were formed is not clear. Again, seepage of groundwater appears to be a likely mechanism. 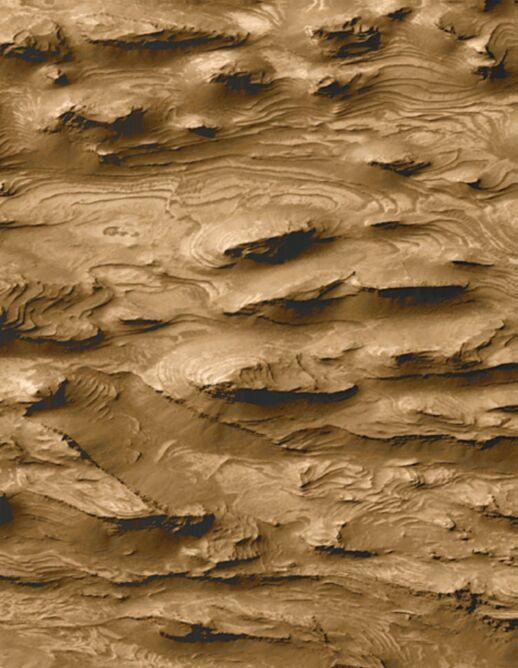 Images obtained from the more recent Mars Global Surveyor mission show clearly that gullies exist on steep crater walls. They were possibly formed by running liquid water down the slope of the wall. 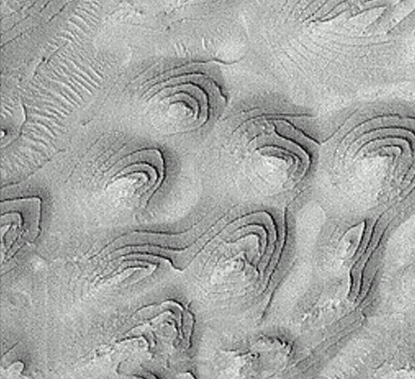 Figure 4.11 shows clearly the gullies and the layering along a sloping surface. It has been suggested that water might have originated from the frozen water embedded within these layers. 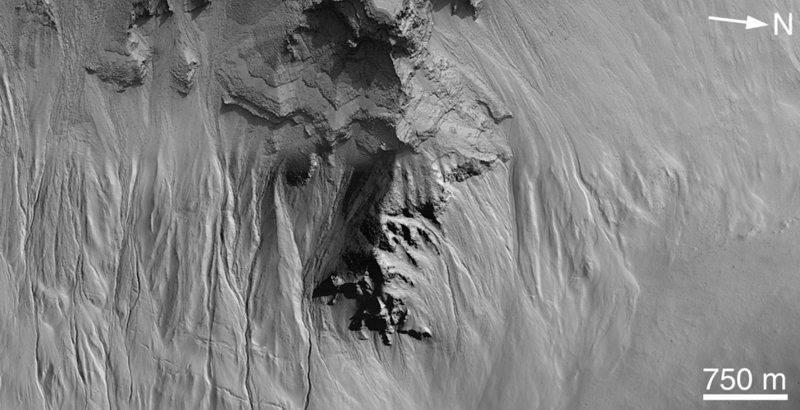 Other gullies can also be found on steep crater walls to form "weeping gullies" (Figure 4.12). 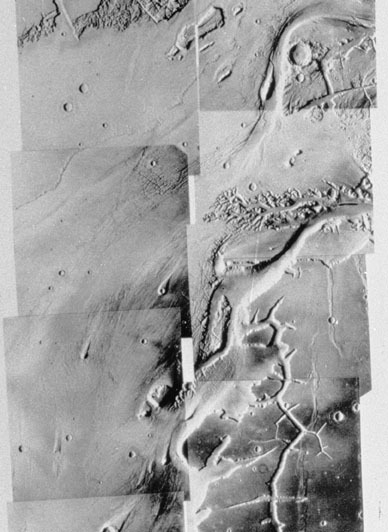 In addition, high resolution images also revealed the many strange-looking layered terrain (Figures 4.13; 4.14; and 4.15). Are they the equivalent of the sedimentary layers on the ocean floors or lake beds on Earth? Further studies are necessary to determine these answers.